If you thought a huge world to explore, a deep roster of side quests, and an expansive main story just wasn’t enough to sink your teeth into with Assassin’s Creed Odyssey, then you’re in luck. On the island of Pephka is an Arena for you to fight through, boasting some of the toughest foes from across the Aegean. 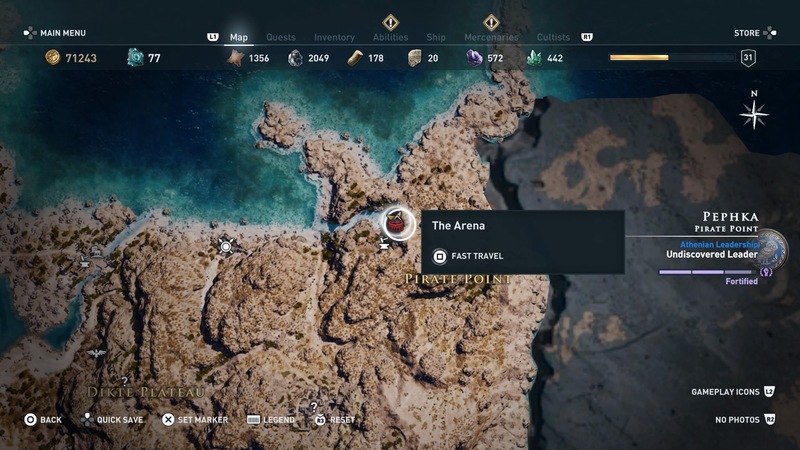 In this Assassin’s Creed Odyssey Arena Guide, we’ll go over how to find the arena, as well as some of things you can do when you get there, along with a few of the rewards. 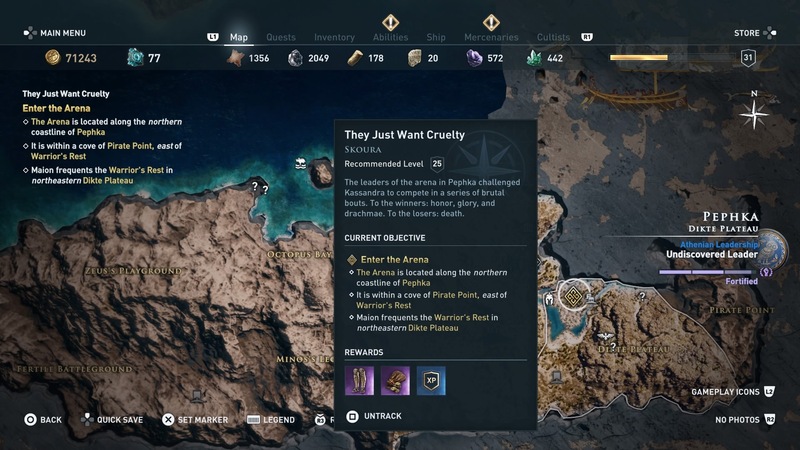 The Arena is on the island of Pephka, in the extreme southwest of Assassin’s Creed Odyssey’s map. You’re probably not going to make your way over here unitl your level is at least in the 20s. This makes Pephka and the arena a good stopping point to gather some XP after the A Family’s Legacy quest. 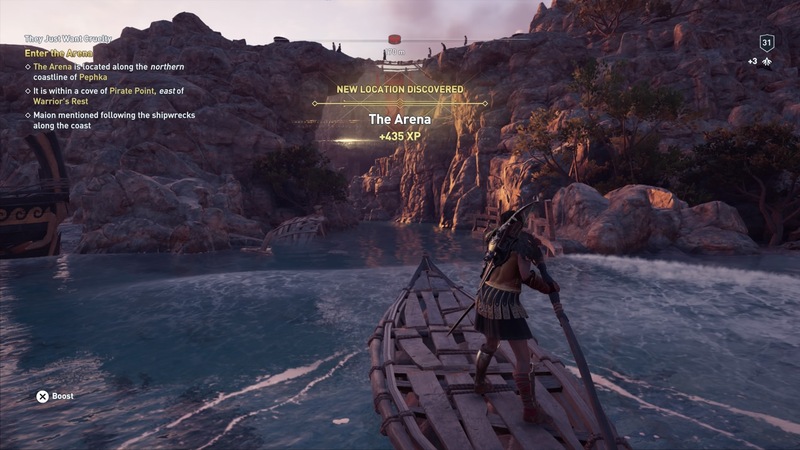 To find the arena specifically, first make your way down to Pephka – the port on the western side of the island is the best place to land – then make your way to the Dikte Plateau area of the island. In the northwest of this area, call Ikaros, and you should be able to pinpoint Maion, the proprietor of the Arena. State your worthiness, and he’ll direct you east along the coast, telling you to use his boat. The small boat is right in front of where you speak to him, and all you need to do is jump aboard and follow the shipwrecks along the coast east. As you make you way forward, eventually under a rope bridge, you’ll reach the Arena. At the entrance, you’ll meet Skoura, speak to him and declare your interest in fighting in the Arena. There two main things to do in the arena, fight the Champions and accept challenges from Mercenaries. 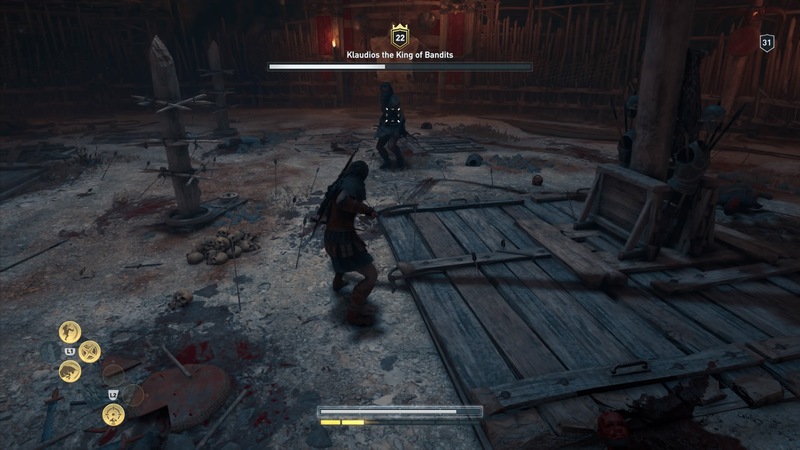 You can see which Mercenary you can fight by accessing the Mercenaries menu, which saves you time finding them out in the world. As for the Champions, these are five tough foes of varying levels that give you Legendary equipment for defeating them. Take them all out and you’ll be crowned Hero of the Arena. Without spoiling too much, defeating all of the Arena Champions is vital to clearing the Cultists menu. As you fight each Champion, you first take on waves of regular enemies before facing them as a final challenge. You’re healed at the end of each round, but there are traps in the Arena so be careful. The weakest opponent that you’ll face in the Pephka Arena is Klaudios, King of Bandits. He fights like normal enemies that use daggers, but with a few extra surprises. On Wave 5, Klaudios will appear. As mentioned, he fights like regular dagger-wielding enemies, but also has a disabling smoke bomb that breaks your combos and a strong, sliding attack. His smoke bomb lets him disappear when under pressure and set up a sneak attack. When he uses it, back off and wait for him to reappear. The sliding attack is also quite easy to deal with since it’s telegraphed by a bright glow. Once he looks like he’s lit a Yankee Candle in his cuirass, hold the dodge button and backwards on the analogue stick to extend your roll out of harm’s way. When he’s down, you’ll get the Arena Fighter’s Gauntlets, the full set of which increases the amount of health you regenerate with Overpower Attacks by 10%. Next up on your fight roster is Belos, the Beast of Sparta, a ferocious opponent that mixes relentless aggression with high damage. You fight Belos at level 29, which will either be insurmountable or a breeze depending on your character level in relation to his. Belos is a brute class fighter, and fights similarly to normal enemies, but he does have a few more techniques that he can call upon. First things first, getting rid of Belos’ shield should be your top priority, so build up a segment of adrenaline and hit him with a Shield Breaker sharpish. He’s a big dude and uses a lot of unblockable and uninterruptible moves where he glows red. Since he uses uninterruptible attacks so often, you’ll need to use perfectly timed slow motion dodges to get a lot of damage in. Belos likes to rush you too, so making use of elemental damage over time – such as the Fanged Bow engraving – is a good strategy against him. The glowing attacks where he swings his axe have a very large radius, so make sure you make use of the extended dodge – by holding the dodge button – to get out of the way. The Huntress is a bit of a change of pace from the rest of the Arena Champions. She fights like elite archers that you can find out in the open world, and similar to the Daughters of Artemis. You also fight predator animals in this arena battle, so you can make use of your bonus damage to animals engravings. Evanthie is pretty straightforward to defeat, but has a couple of quirks that could cause you trouble. First off, she starts the battle with a lion companion, which you should take care of before you focus your attention on the huntress herself. Secondly, she does a triple fire arrow shot which can be difficult to dodge if you’re not expecting it and hit you for a lot of damage. To get out of the way, it’s easiest to extended dodge roll – hold the dodge button – under the arrows, either rolling towards or to the side of the barrage. You could also use your Bull Rush ability to warp through the arrows without taking damage. The penultimate champion in the arena is Titos, the Rock of Athens, and luckily for the Eagle-Bearer is probably the easiest of all the fights you have to face. He fights similarly to Elite light soliders, who pop up pretty frequently in the rest of the game, so you should be able to take care of him pretty quickly. As mentioned, Titos is probably the weakest champion you’ve faced so far, just because he fights very similarly to a lot of normal enemies you’ve faced. One tip is to try and stay close in to Titos and dodge his attacks rather than keep your distance. Otherwise he’ll pull out a bow and try to snipe back at you. 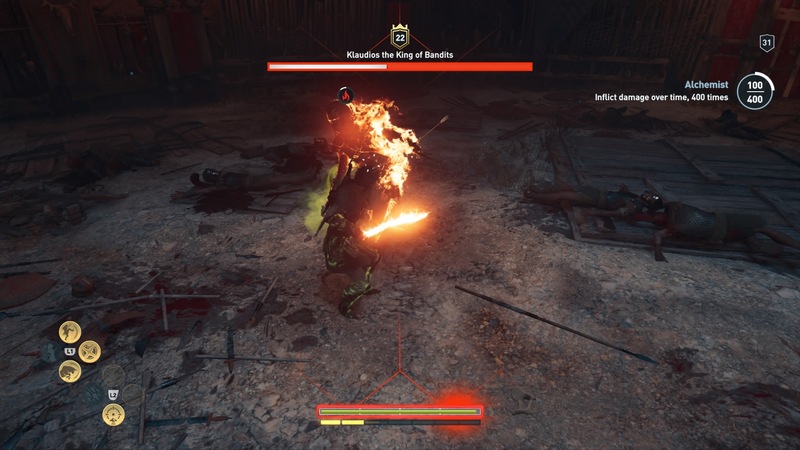 Since there are quite a lot of flame traps on the floor of the arena it can be tricky to dodge his arrows without setting yourself on fire. Once he’s gone down, you’ll get the Arena Fighter’s Waistband, as well as a valuable Cultist Clue.